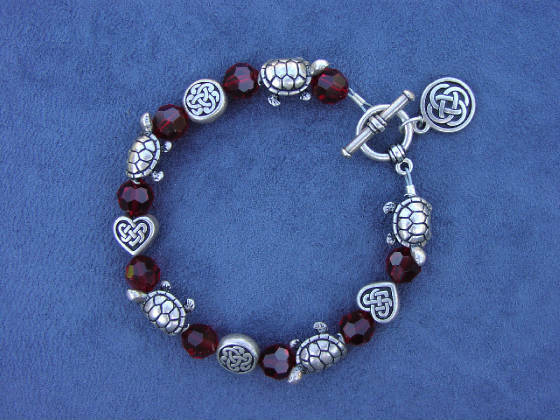 # 470: Deep red Swarovski crystal bracelet with turtles and Celtic knots, very whimsical: $42. # 396: Silvery-gray freshwater pearls, crystal rondelles, and fire polished glass with a large-- but very lightweight-- leaf. 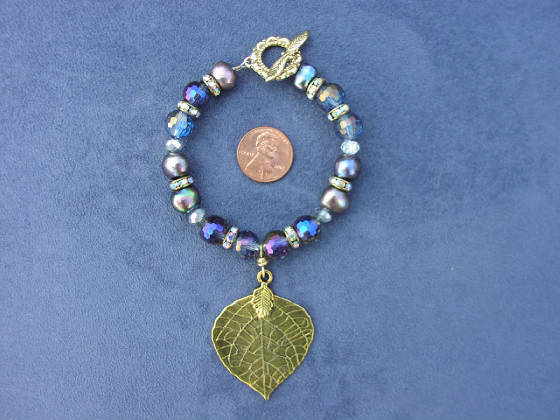 I can also make this piece with a smaller leaf but I like the bold personality of this one! The leaf is very detailed and is slightly different on both sides. Secures with a toggle closure. $36. # 468: Hand-woven bracelet with Czech. 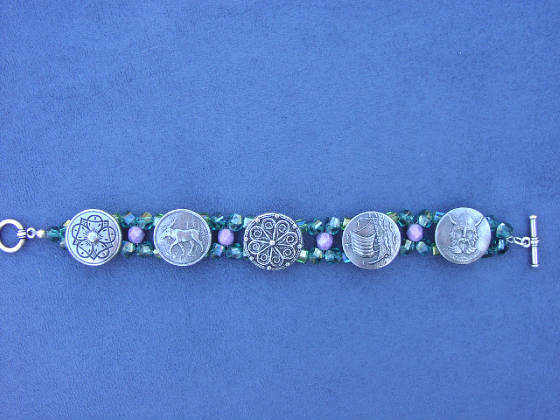 glass and pewter buttons from Norway....Viking, flowers, ship, moose! $48. 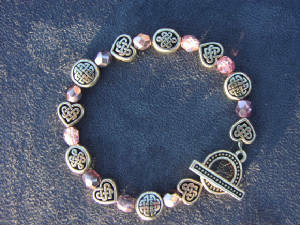 # 389: Leather bracelet with Nordic buttons and Celtic knot charms, the one shown is 7 and 1/2" long. Specify length needed when ordering. $48. # 360: Colors POP when set against black. 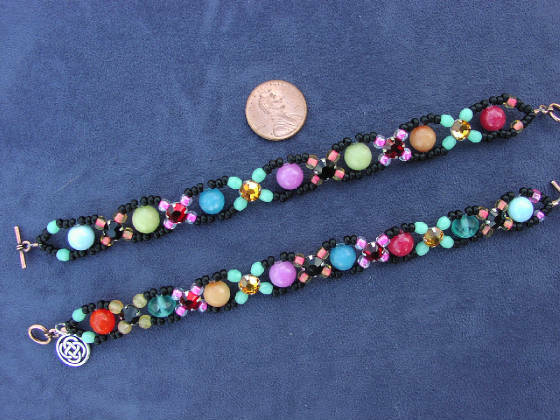 These hand woven bracelets are one of a kind, can be made with or without Celtic knot dangle for the same price: $28. each. Specify length. 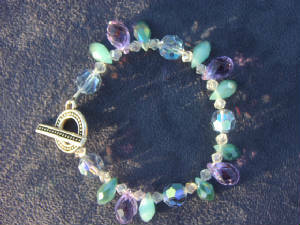 # 469: Silvery shell circles, Swarovski crystal, Celtic knot....$42. 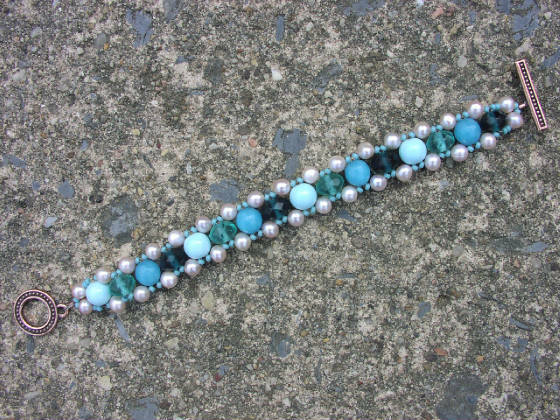 # 361: Hand woven bracelet in ocean colors of blues, and greens ...made with jade, glass, and freshwater pearls. $42. # 362: This one reminds me of summer desserts and drinks like sherbert and mint julep....Made from glass and jade. $25. 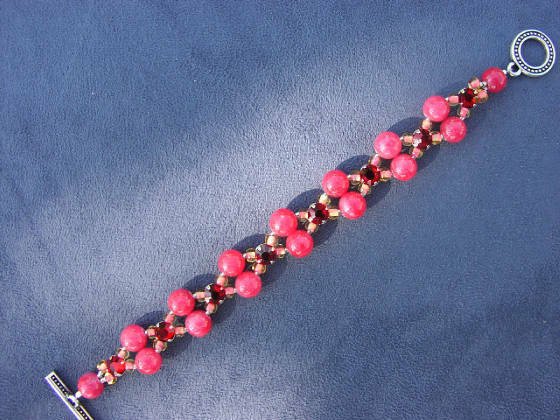 # 363 (2 photos above): Shiny RED bracelet made with dyed jade and Swarovski crystal. I have always loved shiny red! 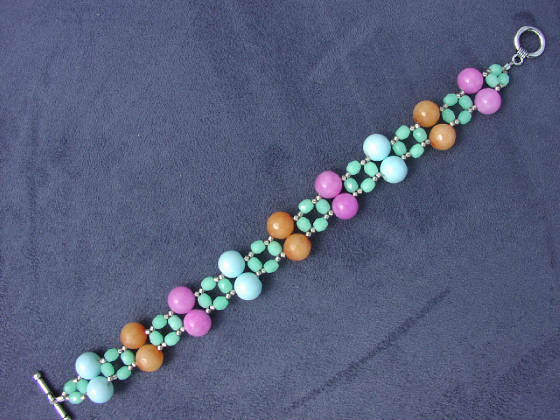 This bracelet is $32. 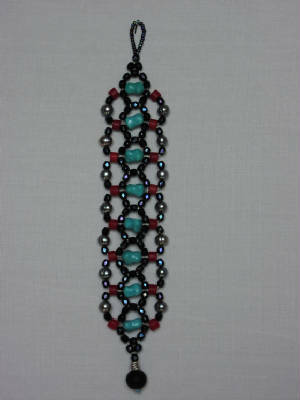 #093: Handwoven cuff bracelet, shown with pearls, turquoise and glass beads: $48. # 375: Hand woven bracelet with Czech. 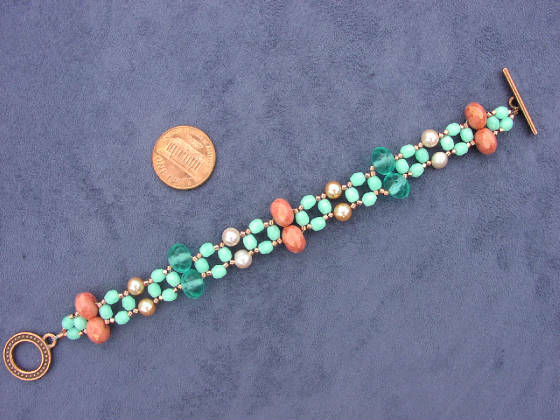 glass and freshwater pearls...shades of coral, pearl, blues and greens really makes me think of the ocean: $42. 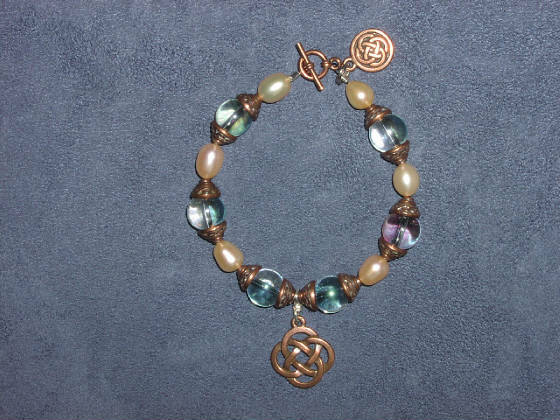 #238: Bracelet with Celtic knots, glass, freshwater pearl and toggle clasp: $36. 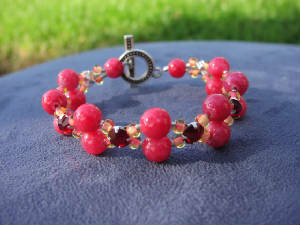 This bracelet is a good match with necklace and earring set #239. 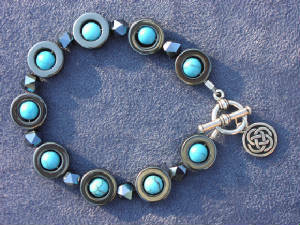 # 292: Hematite circles bracelet with turquoise and Celtic knot dangle: $32. 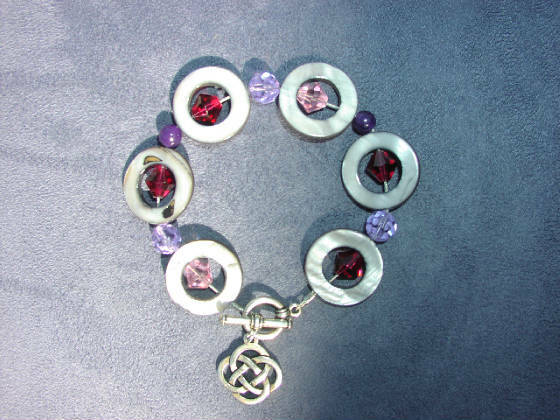 # 293: Celtic knot bracelet with lavender Czech. glass. Sells for $32. 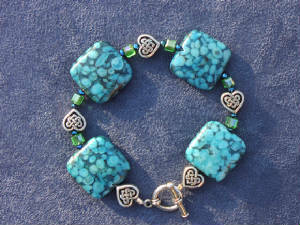 # 294: Bracelet with Celtic knot hearts and dyed howlite squares: $32. 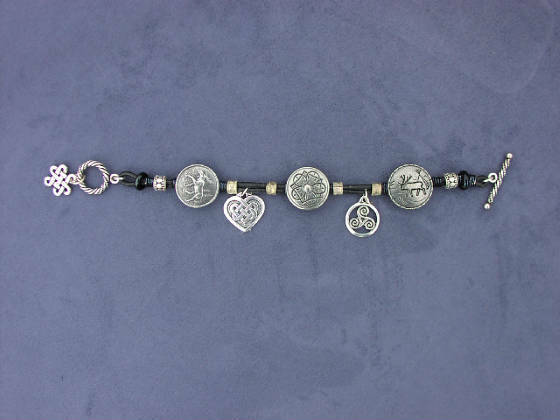 # 296: Crystal bracelet...teardrops and antique rounds. Cool and light for summertime. $36.